Yadollahi, E., Shareghi, B., Salavati, M. (2017). Comparative Studies on the Interaction of ‎Proteinase-K with Fe2O3, Fe3O4 and SiO2 ‎Nanoparticles. 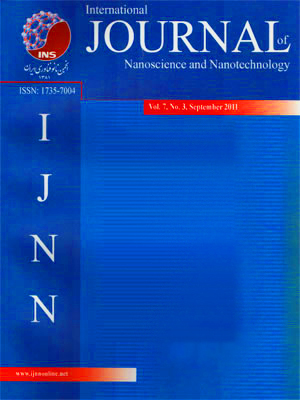 International Journal of Nanoscience and Nanotechnology, 13(2), 187-194. E. Yadollahi; B. Shareghi; M. Salavati. "Comparative Studies on the Interaction of ‎Proteinase-K with Fe2O3, Fe3O4 and SiO2 ‎Nanoparticles". International Journal of Nanoscience and Nanotechnology, 13, 2, 2017, 187-194. Yadollahi, E., Shareghi, B., Salavati, M. (2017). 'Comparative Studies on the Interaction of ‎Proteinase-K with Fe2O3, Fe3O4 and SiO2 ‎Nanoparticles', International Journal of Nanoscience and Nanotechnology, 13(2), pp. 187-194. Yadollahi, E., Shareghi, B., Salavati, M. Comparative Studies on the Interaction of ‎Proteinase-K with Fe2O3, Fe3O4 and SiO2 ‎Nanoparticles. International Journal of Nanoscience and Nanotechnology, 2017; 13(2): 187-194. The interaction of Fe2O3, Fe3O4 and SiO2 nanoparticles with proteinase K activity was investigated using UV–vis spectroscopy. Proteinase K EC (3.4.21.14) is a member of serine protease family, which is produced from fungus Tritirachum album Limber.The effects of nanoparticles on proteinase K activity were studies at 40˚C in pH 7.0 using sodium phosphate as buffer. It was found that in the presence of nano-Fe2O3 and nano-Fe3O4, Vmax was decreased but Km was constant. This results indicated that nano-Fe2O3 and nano-Fe3O4 acted as noncompetitive inhibitors. In the presence of nano-SiO2 the amount of Km increased but Vmax decreased, that showed nano-SiO2 acted as a mixed inhibitor. The dissociation constant (Ki) value for binding nano-Fe2O3, nano-Fe3O4 to proteinase K was equal to 11µM and 8.5µM respectively that indicated the binding of nano-Fe3O4 to the enzyme was stronger than nano-Fe2O3. The KI and Ki value for nano-SiO2 was 22.5µM and 8µM respectively. Lange, G., Betzel, Ch., Branner, S., Wilson, K. S. (1994). “Crystallographic Studies of Savinase, a Subtilisin-like Proteinase, at pH 10.5”, Eur. J. Biochem, 224: 507-518. Neurath, H. (1986). “The versatility of proteolytic enzymes”, J. Cell. Biochem, 32: 35-49. Russel, A. J., Fersht, A. R. (1987). “Rational modification of enzyme catalysis by engineering surface charge”, Nature, 328: 496-500. Carter, P., Wells, J. A. (1988). “Dissecting the catalytic triad of a serine protease”, Nature, 332: 564-568. Ebeling, W., Hennrich, N., Klockow, M., Metz, H., Orth, H. U., and Lang, H. (1974). “Proteinase K from Tritirachium album limber”, Eur. J. Biochem, 47: 91-97. Wiegers, U., Hilz, H. (1971). “A new method using ‘proteinase K’ to prevent mRNA degradation during isolation from HeLa cells”, Biochem Biophys Res Commun, 44: 513–519. Wells, J A., Estell, DA. (1988). “Subtilisin — an enzyme designed to be engineered”, Trends Biochem Sci, 13: 291–297. Hilz, H., Wiegers, U., Adamietz, P. (1975). “Stimulation of proteinase K action by denaturing agents: application to the isolation of nucleic acids and the degradation of maskedproteins”, Eur J Biochem, 56: 103–108. Shaw, WV. (1987). “Protein engineering: The design, synthesis and characterization of factitious proteins”, Biochem J, 246: 1–17. 10. Liu, SQ., Meng, ZH., Yang, JK., Fu, YX., Zhang, KQ. (2007). “Characterizing structural features of cuticle-degrading proteases from fungi by molecular modeling”, BM Struct Biol, 7: 33. 11. Martin, JR., Mulder, FAA., Karimi-Nejad, Y., Van der Zwan, J., Mariani, M., Schipper, D., Boelens, R. (1997). “The solution structure of serine protease PB92 from Bacillus alcalophilus presents a rigid fold with a flexible substrate-binding site”, Structure, 5: 521–532. 12. Müller, A., Hinrichs, W., Wolf, WM., Saenger, W. (1994). “Crystal structure of calcium-free proteinase K at 1.5-A resolution”, J Biol Chem, 269: 23108–23111. 13. Betzel, C., Pal, GP., Saenger, W. (1988). “Three-dimensional structure of proteinase K at 0.15-nm resolution”, Eur J Biochem, 178: 155–171. 14. Betzel, C., Teplyakov ,AV., Harutyunyan, EH., Saenger, W., Wilson, KS. (1990). “Thermitase and proteinase K: a comparison of the refined three-dimensional structures of the native enzymes”, Protein Eng, 3: 161–172. 15. Murray,C.B., Kagan, C.R, et al. (2000). “Synthesis and Characterization of Monodisperse Nanocrystals and Close-Packed Nanocrystal Assemblie”, Annual Review of Materials Science, 30: 545-610. 16. Morose, G. (2010). “The 5 principles of “Design for Safer Nanotechnology””, Journal of Cleaner Production, 18: 285-289. 17. Bellova, A., Bystrenova, E., Koneracka, M., Kopcansky, P.,Valle, F., Tomasovicova, N., Timko, M., Bagelova, J., Biscarini, F., Gazova, Z. (2010). “Effect of Fe3O4 magnetic nanoparticles on lysozyme amyloid aggregation”, Nanotechnology, 21: 065103. 18. Skaat, H., Margel, S. (2009). “Synthesis of fluorescent-maghemite nanoparticles as multimodal imaging agents for amyloid-β fibrils detection and removal by a magnetic field”, Biochem, Biophys, Res Commun, 386: 645-49. 19. Zhang, R., Song, M., Li, X., Guan, Z and Wang, X. (2006). “In situ electrochemical contact angle study of hemoglobin and hemoglobin-Fe3O4 nanocomposites”, Analytical and bioanalytical chemistry, 386: 2075-2207. 20. Wang, Y., Wang, B., Zhu, M-T., LI, M., Wang, H.-J., Wang, M., Ouyang, H., Chai, Z.-F., Feng, W.-Y. & Zhao, Y.-L. (2011). “Microglial activation, recruitment and phagocytosis as linked phenomena in ferric oxide nanoparticle exposure. exposure”, Toxicology letters, 205: 26-37. 21. Wu, X., Narsimhan, G. (2008). “Effect of surface concentration on secondary and tertiary conformational changes of lysozyme adsorbed on silica nanoparticles”, Biochimica et Biophysica Acta (BBA)-Proteins & Proteomics, 1784: 1694-1701. 22. Sadeghi kaji, S., Shareghi, B., Salavati, M. (2014). “Urease Activity Protection with EDTA against Nanoparticles (Fe2O3 and Fe3O4) Inactivation”, Journal of Nanostructures, 4:217-226. 23. Shareghi, B., Hashemian, A., Farhadian, S., Salavati-Niasari, M., Saffar, B., Moshtaghi, H. (2013). “Thermal Inactivation and Aggregation of Lysozyme in the Presence of Nano-TiO2 and Nano-SiO2 in Neutral pH”, JNS, 3: 281-288. 24. Shu-Qun, L., Zhao-Hui, M., et al. (2010). “Insights derived from molecular dynamics simulation into the molecular motions of serine protease proteinase K”, J Mol Model, 16: 17-28. 25. Palmer, T. (2001). “Enzymes: biochemistry, biotechnology and clinical chemistry”, Horwood Publishing Limited, 98-134. 26. Shareghi, B., Farhadian, S., Zamani, N., Salavati-Niasari, M., Moshtaghi, H., Gholamrezaei, S. (2015). “Investigation the activity and stability of lysozyme on presence of magnetic nanoparticles”, Journal of Industrial and Engineering Chemistry, 21: 862-867. 27. Betzel, C., Gourinath, S., Kumar, P., Kaur, P., Perbandt, M., Eschenburg, S. (2001). “Structure of a serine protease proteinase K from Tritirachium album limber at 0.98resolution”, Biochemistry, 40: 3080-3088. 28. Segel Irwin, H. (1993). “Enzyme Kinetics: Behavior and Analysis of Rapid Equilibrium and Steady-State Enzyme Systems”, Wily-Interscience. 29. Kraus, E., Kiltz, HH., Femfert, UF., Hoppe-Seyler’s, Z. (1976). “The specificity of proteinase K against oxidized insulin B chain”, Physiol, Chem, 357: 233-237. 30. Khayat Sarkar, Z., Khayat Sarkar, F. (2011). “Synthesis and Magnetic Properties Iinvestigations of Fe3O4 Nanoparticles”, Int. J. Nanosci. Nanotechnol, 7: 197-200. 31. Nadafan, M., Malekfar, R., Dehghani, Z. (2015). “Investigation in to Properties of Polyurethane Closed Cell by High Loading of SiO2 Nanoparticles”, Int. J. Nanosci. Nanotechnol, 11: 185-192. 32. Dahmardeh, A., Davarpanah, A M. (2015). “Investigation on Influences of Synthesis Methods on the Magnetic roperties of Trimetallic Nanoparticles of Iron -Cobalt-Manganese Supported by Magnesium Oxide”, Int. J. Nanosci. Nanotechnol, 11: 249-256.